Excellent environmental protection, dust collection system and anti-noise design. The opening of discharge gate can be adjusted by hydraulic system as per specific requirements. Emergency discharging function: when the machine accidentally stops, it is able to manually open the discharging gate and discharge the remaining admixtures. The batcher, with 3-5 aggregate hoppers, can be assembled as per individual requirements. There are independent weighing hoppers and belt conveyor under the aggregate hoppers that could be designed as steel structure type, underground and half-underground types. The aggregates can be fed into the aggregate hoppers by loader or belt conveyor. The hopper discharging gates and discharging speed are controlled by computer via cylinder. After aggregates scaling, the aggregates will be conveyed into the transitional hopper. Each and every aggregate is weighed individually or accumulatively, and the weighing accuracy is guaranteed. 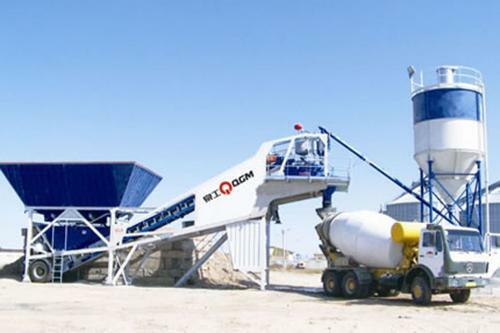 The accuracy of aggregates proportional ratio is realized through computer control system, which automatically re-feeds the aggregates if there is shortage of weight, warns if there is overweight. The aggregates are conveyed into the hopper by the inclined angle ≤20°belt conveyor, with the gravity tension device or by the trough belt conveyor in order to save space. The closed aggregates belt conveyors are designed to avoid aggregates overflowing and noise pollution. The mixing tower can be designed as "—", "L", and "T" shapes. Extensional designs are feasible as per specific requirements. The liquid admixture weighing system, with weighing sensor, has unique leakage-proof device. The liquid admixtures, mixed with water, spray out in the mixer. Different weighing formulas can be designed as per different quality of materials, from storing, conveying, to weighing. The management computer is a backup computer for the whole electric control system. When the control computer is out of order, the management computer can be changed into the control computer to control production. Long-distance trouble shooting by internet and teleservice, which greatly improves the user's ability to trouble shoot the system. The control room, which is made of colorful shaped steel plates, is capacious, anti-noise and heat insulated. It guarantees the working temperature of the electrical components, also improves the working comfortability. The fully closed mixing tower and closed belt conveyor greatly reduce the dust and noise pollution. Add. : Taoyuan Industrial Zone, Fengzhou, Quanzhou City, Fujian Province.